We all dream of relaxing on the beach, feeling the soft sand between our toes and the warm sun on our skin… but that’s not every day at the beach. Sometimes it rains. I love sitting on the balcony, drink in hand, watching the rain. During a light rain, it’s relaxing. During a thunderstorm, it can be beautiful. But for kids, it’s often a boring day, stuck inside wishing to be on the beach. Instead of playing in the sand, you’re just stuck staring at it. If your kids are needing a place to go (or if you’re still a kid at heart and need a place to go yourself) here are some fun Clearwater Beach rainy day activities. The Clearwater Marine Aquarium is a must-do for the whole family! It’s not your typical aquarium. The Clearwater Marine Aquarium is a marine life rescue center focused on the rescue, rehabilitation and release of sick or injured marine animals. While visiting the Clearwater Marine Aquarium, you’ll get a chance to meet Winter the dolphin, star and inspiration of the hit movies Dolphin Tale and Dolphin Tale 2, both filmed on location. The Tampa Bay Escape Room, located in downtown Clearwater, is a real-life escape room game! Perfect for video game enthusiasts, families and friends, you’ll race the clock to find clues, solve puzzles and crack codes that will allow you to the exit the room! Will you be able to beat the clock? The Tampa Bay Escape Room comes with three different escape rooms: Tragic Magic, Kidnapped and Cabin in the Woods. The Museum of Science & Industry, located in Tampa, is a great place for all day fun! The museum has exhibits on weather, dinosaurs, space, flight, natural disasters, human development life stages, an IMAX Dome Theater and the Saunders Planetarium. If the weather clears up while you’re at the museum, there’s also an outdoor ropes course and zip line! If the rain has you trapped inside and your kids are full of energy, take them to AirHeads Trampoline Arena! AirHeads Trampoline Arena is a full, indoor, trampoline park making it a great place to escape the rain. Just jump around and have fun, play some AirSports like dodgeball or basketball, or have fun playing some arcade games! Vertical Ventures, located in St. Pete, is a State-of-the-art indoor climbing area! The 20,000 square foot facility features 40-foot tall routes with 80+ climbing lines. Whether you’re climbing for the first time, or if you’re a seasoned pro, you’ll find a safe but challenging, climbing area that fits your level. 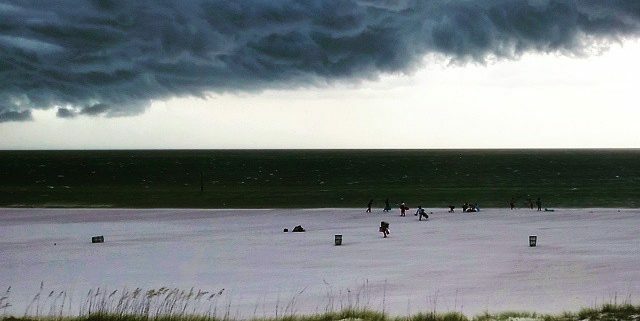 These Clearwater Beach Rainy Day Activities will keep you moving and entertained during those cloudy and rainy days. I hope the sun comes out soon so you’ll back on the beach and won’t miss another beautiful Clearwater Beach sunset! If you’re looking for more fun things to do in Clearwater, check out: Clearwater Beach Family Activities. Thank you for the great ideas. I’m new to the area and have a lot of family come to visit “sunny” Florida. The Best Luxury Rentals on Clearwater Beach! Clearwater Beach – Where to Eat, Stay & Play! 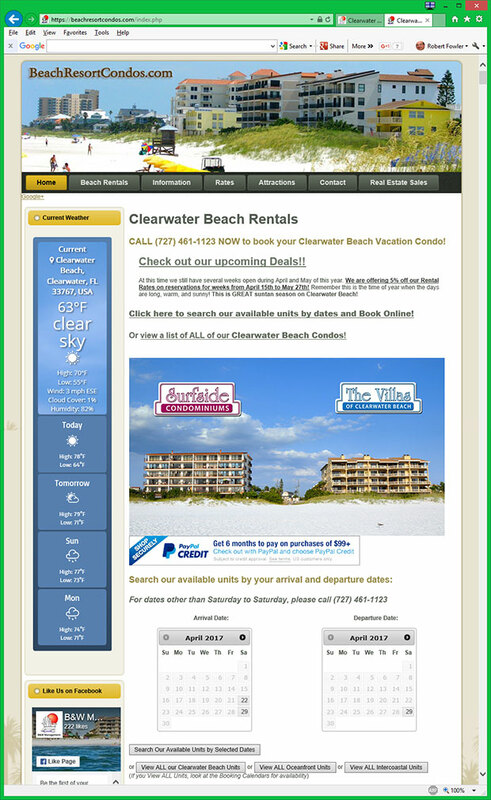 Check out our Clearwater Beach Weather Page! Vacation Rentals conveniently located on Clearwater Beach near St. Petersburg, Tampa, St. Pete Beach, Treasure Island and all of Tampa Bay. All Content and Design Copyright © 2007-2018 B&W Management Inc.